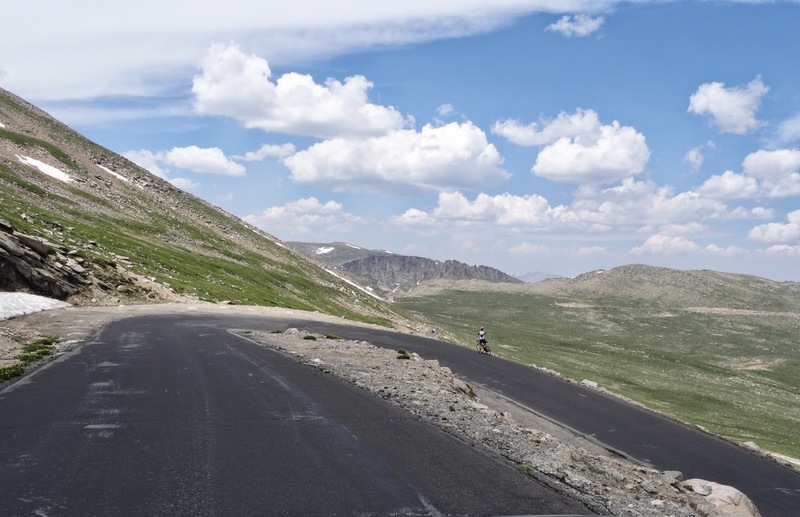 The mountaintop reaches to 14,265 feet (4,348 m) in altitude, and man built a road to the top. I can't believe they put a road up here - this is something you might say out loud at least three times while driving the 15-miles to the tippy-top. Because there is no reason for the road, other than for our enjoyment. 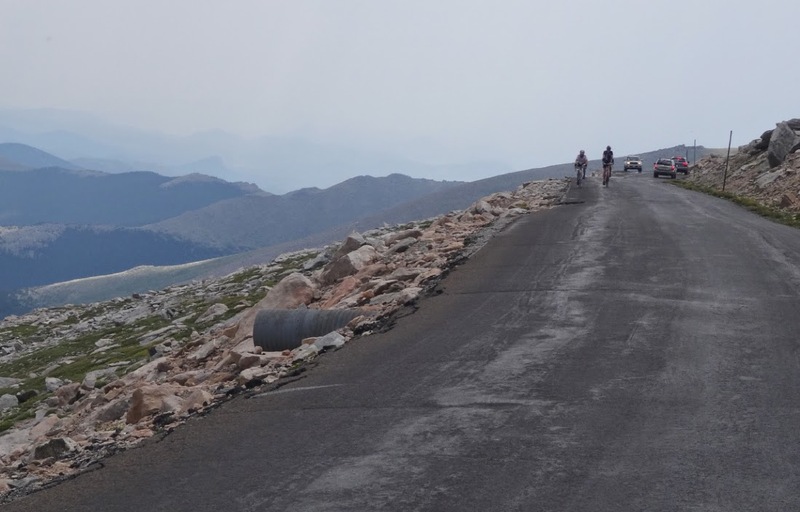 The line I heard from cyclists as they reached the top went something like, "This is what death looks like," "I feel like I am drunk," and "This is insaneness." Doesn't that make you want to go? Mt Evans is on my mind this week for three reasons: 1) The Mt Evans Hillclimb race is this weekend, 2) I received an email recently from an out of state tourist wondering what other activities they should try to do while in Colorado for the USA Pro Challenge next month, and 3) I went on a super cool wildflower hike on Mt Evans last Saturday. 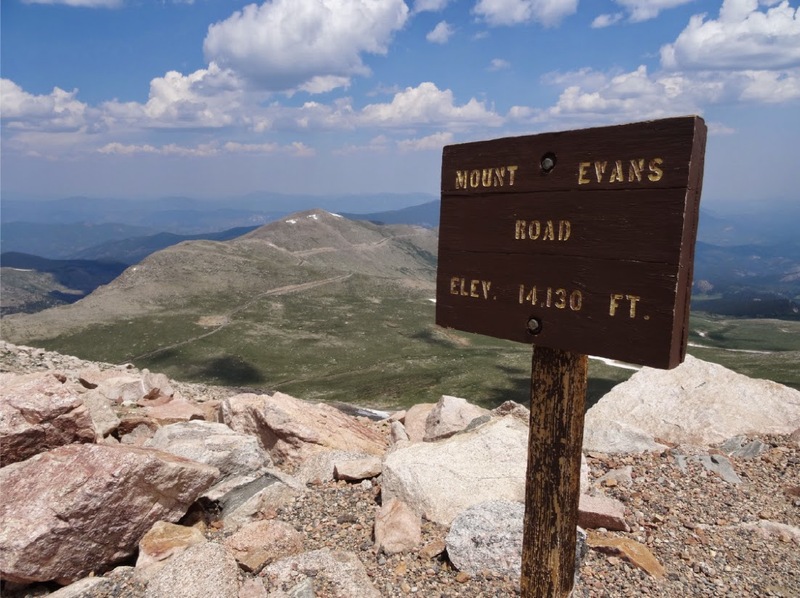 Mt Evans is west of Denver (south of Idaho Springs), and the closest to Denver of Colorado's 54 "fourteeners" (mountains over 14,000ft elev.). 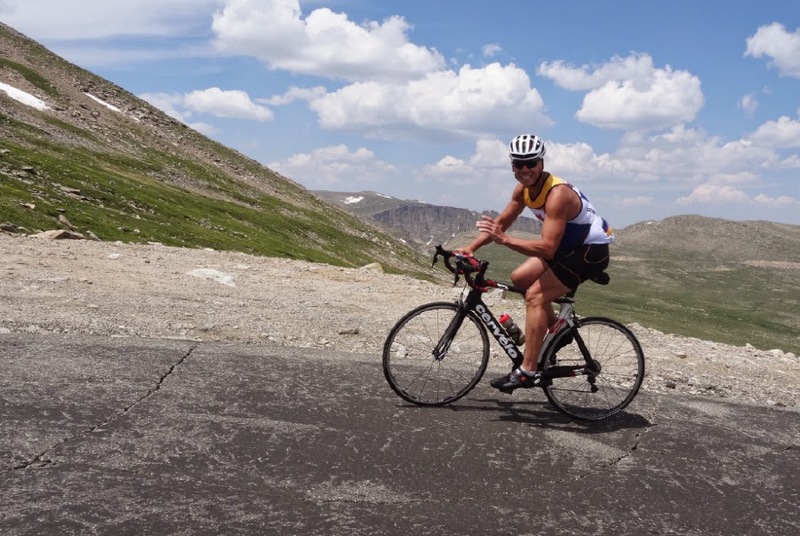 People race a bike up this mountain, for fun. Sponsored by Team Evergreen, the first race began in 1962, and after this weekend, will have been held 49 times (with three cancellations). In 1981 it was renamed in honor of five-time race winner Bob Cook, who died of cancer at the age of 23. The race is 27.4 miles (44.1 kilometers) in length. Volunteers are instrumental in the success of this race which is scheduled for Saturday, July 26th, 2014, registration is still open. 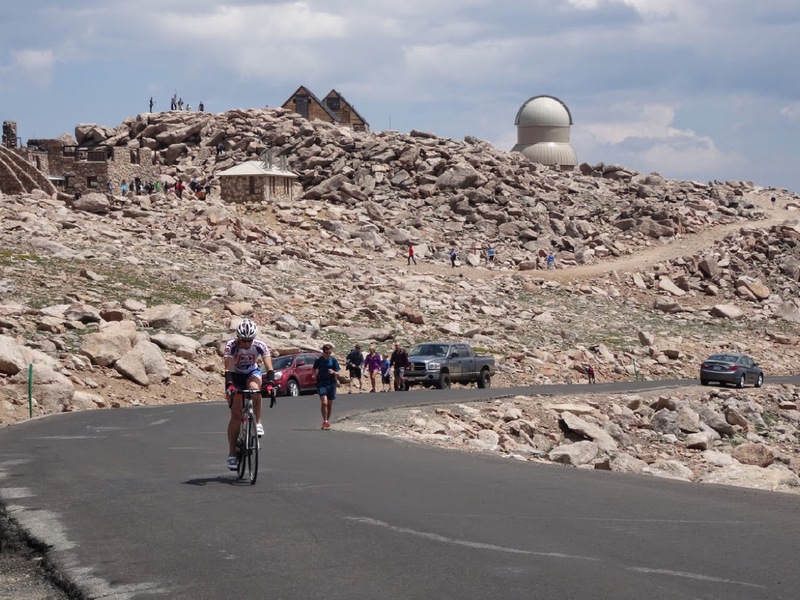 The record for fastest ascent was set in 2004 by Tom Danielson, in a time of 1:41:20 (note: Danielson's race results were voided between March 1, 2005, and September 23, 2006 due to doping). Bob Cook held the course record from 1975-1980. Race participants number between 600-1000 every year and range in age from nine to eighty-five years. Go test yourself on this massive challenge. My nephew, Kenneth Rakestraw, won his category in 2009 at the age of 21, in a time of 2:05:31. A few big corners but mostly a road along a mountain side. Then you have to go all the way back down the mountain after the race up. 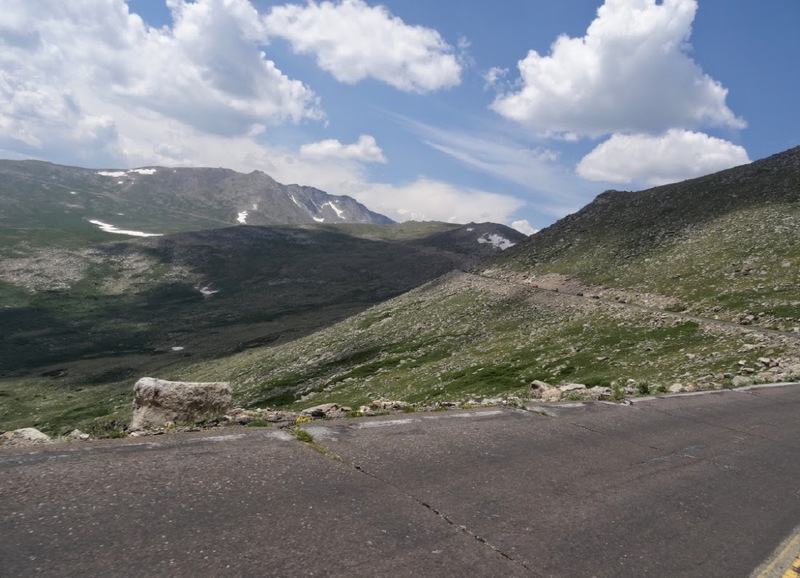 Mount Evans is the highest paved road in the United States. 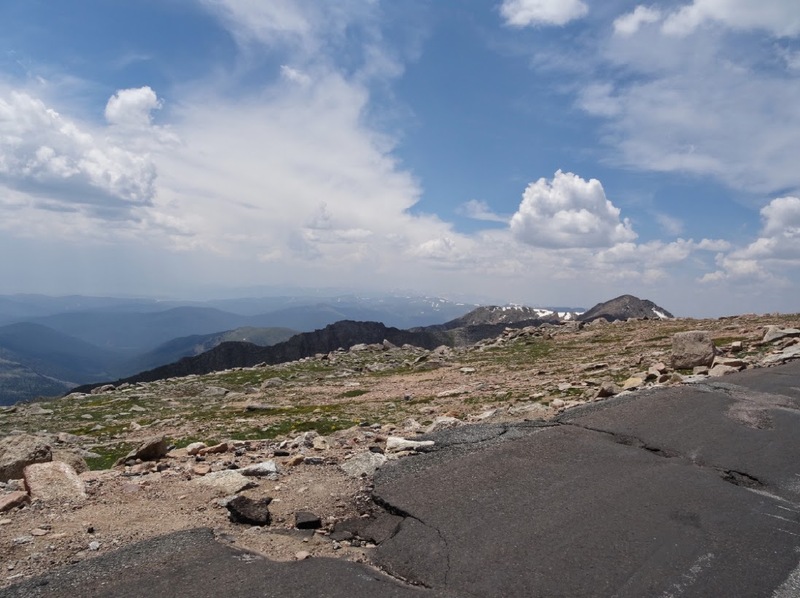 Opened in 1931, the forest service guide states the the road was built as part of the Peak to Peak Highway system intended to link Longs Peak (14,259' / 4,346 m) to Pikes Peak (14,114' / 4,302 m). 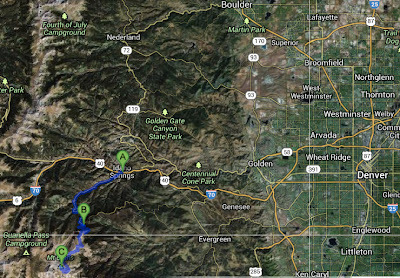 This section of the scenic byway was planned to reach around the west side of the summit and down to Hwy 285 below; it was never completed, considered unfeasible. 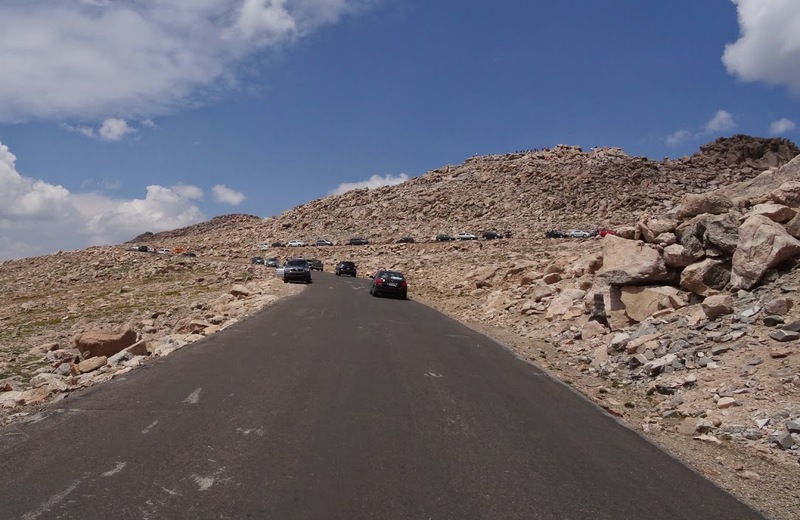 The road instead was extended just short of the summit at 14,130ft. 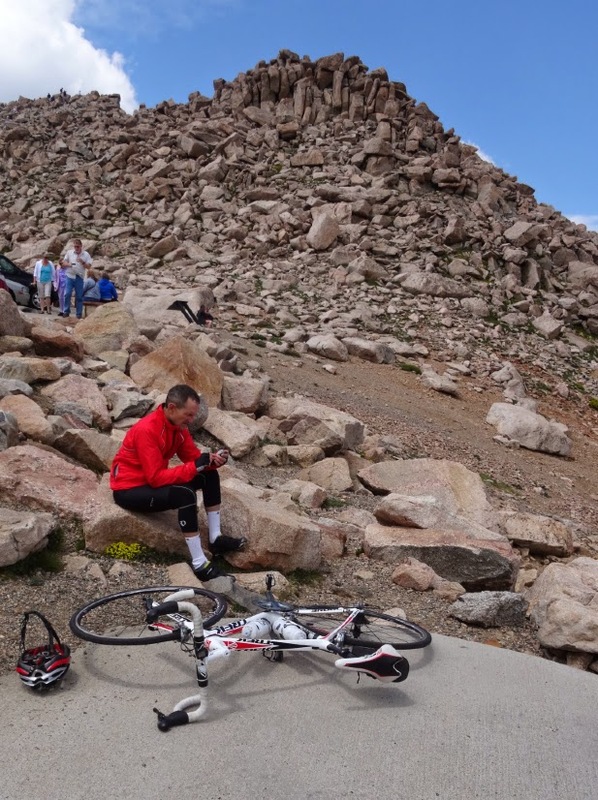 Tourists will quickly feel the thin air during even short efforts, cyclists will feel the high altitude during a very long hard effort. The park brochure explains, every 1,000 feet gain in the mountains is equivalent to traveling 600 miles north in latitude. "In only 45 minutes, you will drive through a landscape that reflects the upper regions of North America." 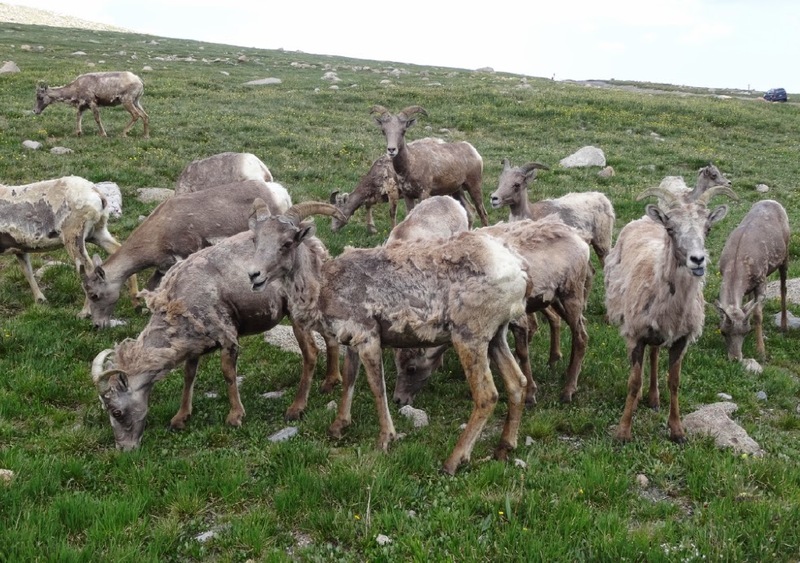 Parking lots and spaces are very limited, but there are several spots along the road worth stopping and hiking. The Dos Chappell Nature Center, located 2.9 miles from the Fee Station is informative. 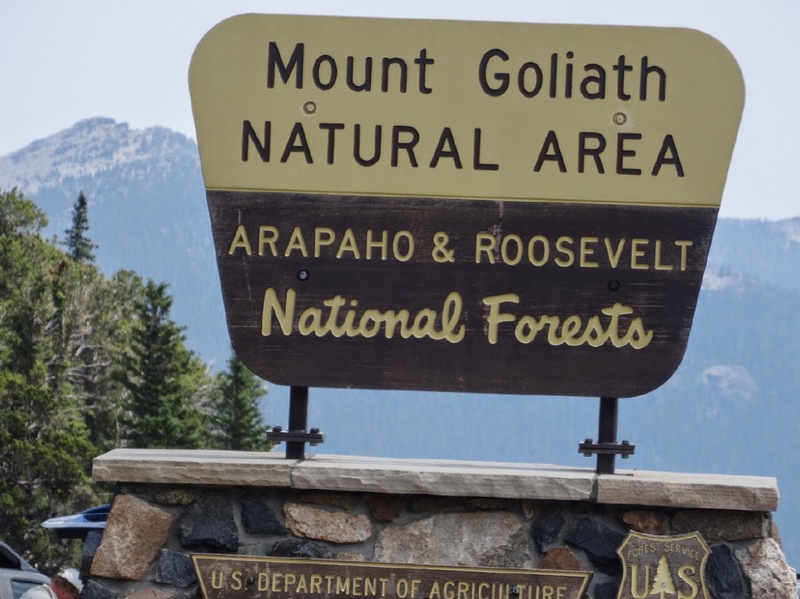 The Mount Goliath Natural Area (short hike) is a wonderful short but rugged walk. There are numerous hiking trails on the mountain. 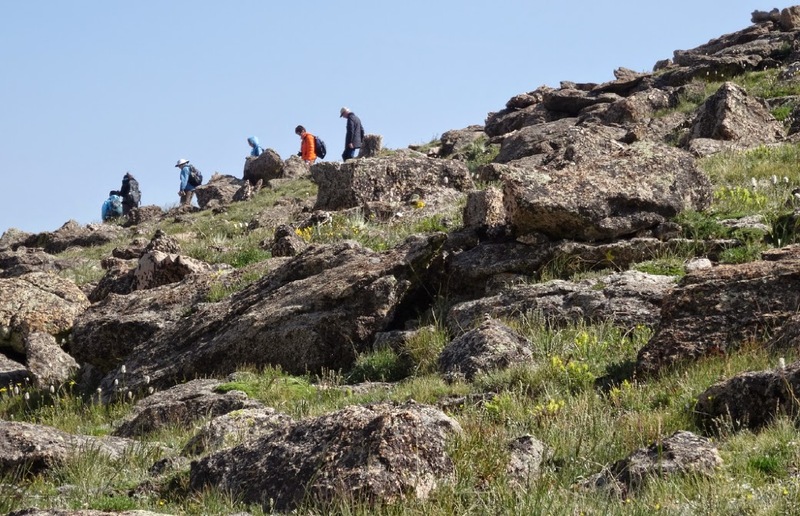 Even with easy access from Denver, beware that this is cautionary seasonal mountain hiking, two bodies were discovered on the mountain just this week, missing since April. 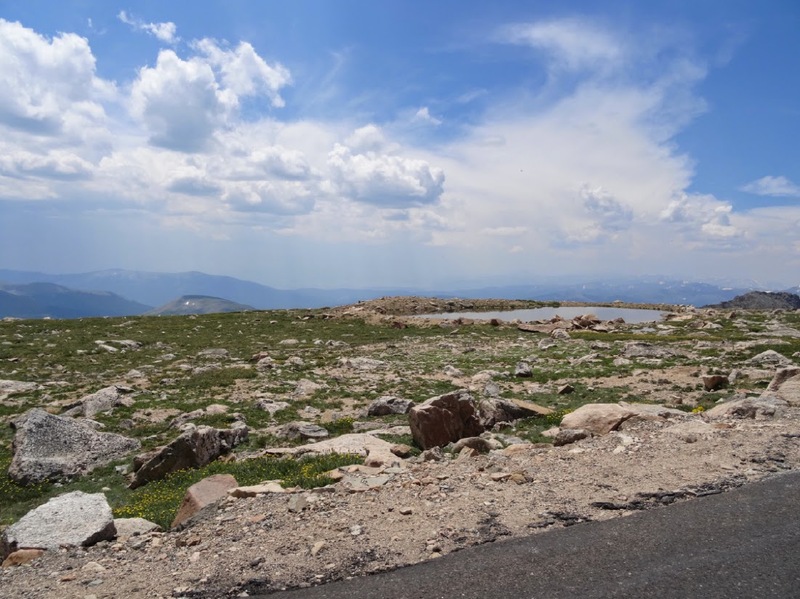 If you are visiting Colorado, I recommend Mount Evans as a top tourist sight in Colorado. If cycling in late August, go with sag support if possible. Seven years ago, I was riding my bike over the Col du Lautaret in France, looking down at a huge group of botanists spread out across the fields below my climb up the Col du Galibier. 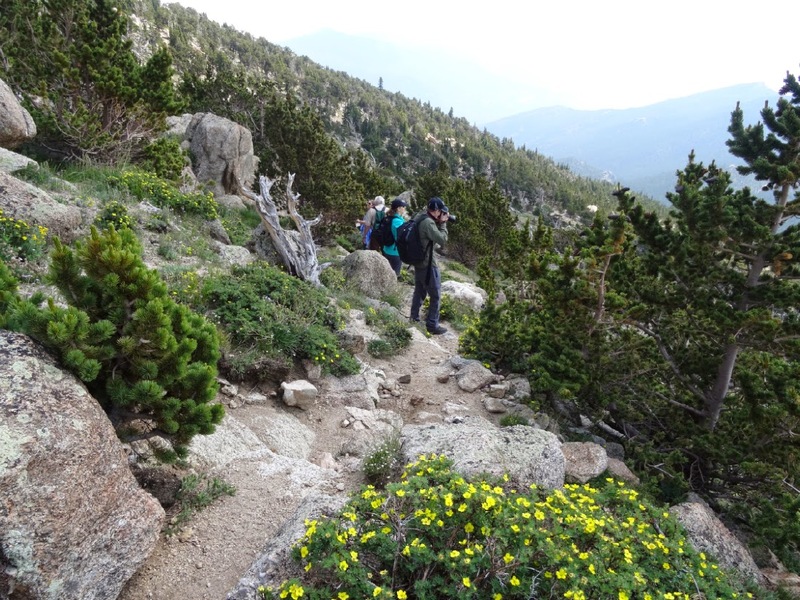 As I pondered their day out searching and studying wildflowers in the Alps, I decided, someday I am going to do that. 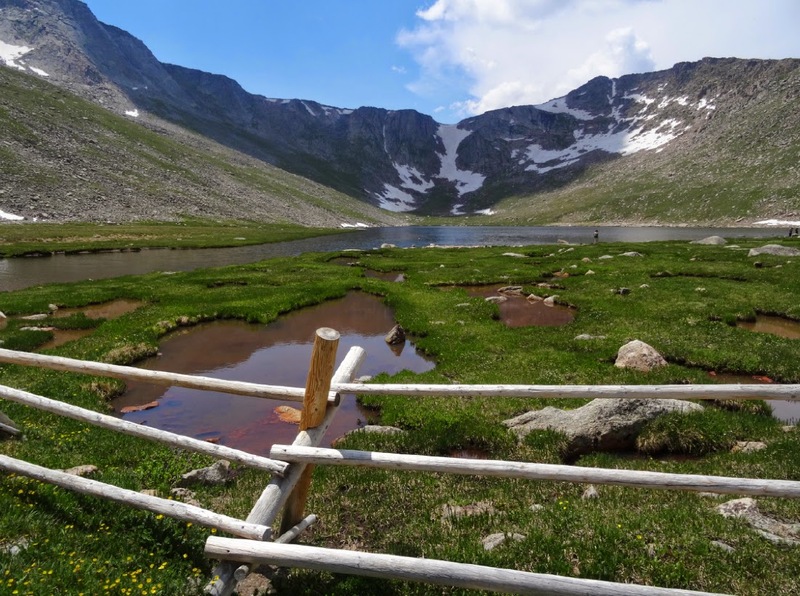 So last Saturday, wanting to bring something into my mind and body other than cycling, and inspired by the Tour de France traversing the Col du Lautaret that very day, I joined a free guided wildflower walk on Mount Evans. 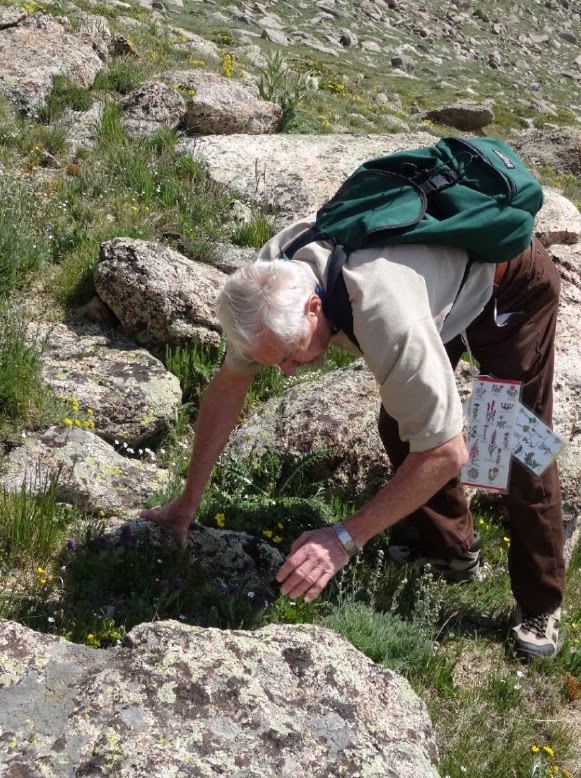 Sponsored through the Denver Botanic Gardens, we walked (very slowly) looking at tiny plants along the Mt Goliath Natural Area trail at 11,040 ft. I learned so much and totally enjoyed my time with our guide and fellow flower hunters. The wildflowers peak around July 4th, but there was still plenty for us to identify. 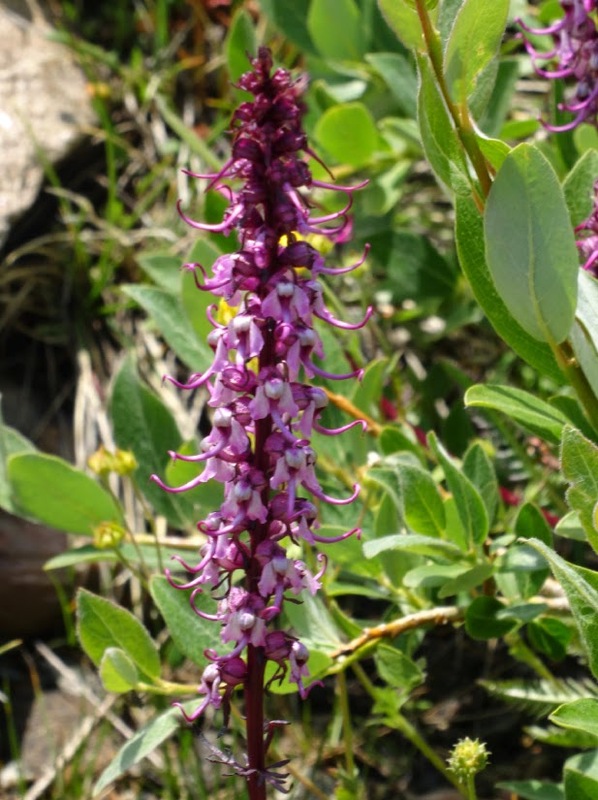 Our guides had sent us a list of 108 different floral species found on the mountain. 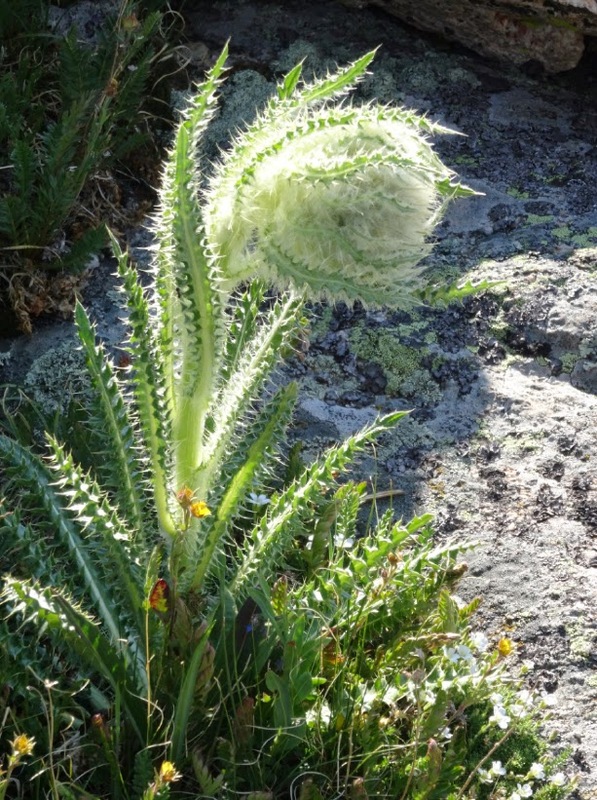 All of the flowers located in the alpine rock garden at the Denver Botanic Gardens have been transplanted from this preserve area. 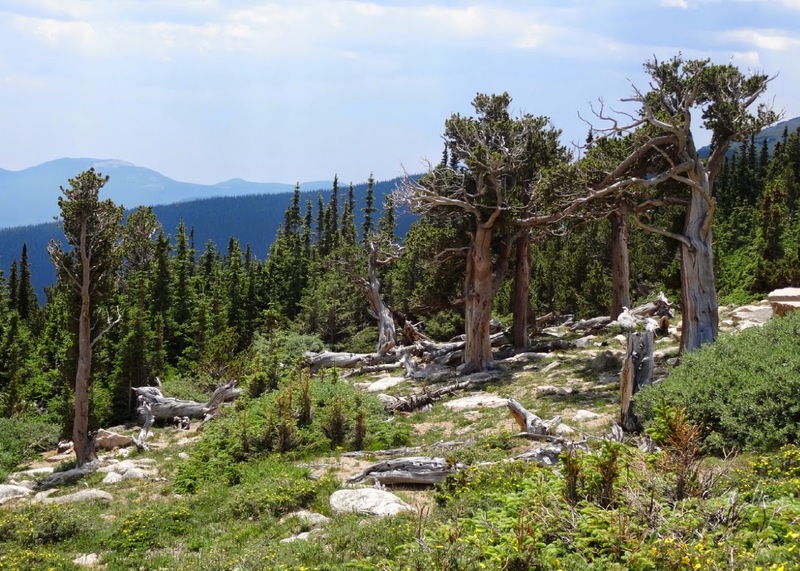 The harsh environment yields trees hundreds of years old that grow inches per year. This is wild land with twisted tree trunks and plants that root 15 feet into the earth for survival. 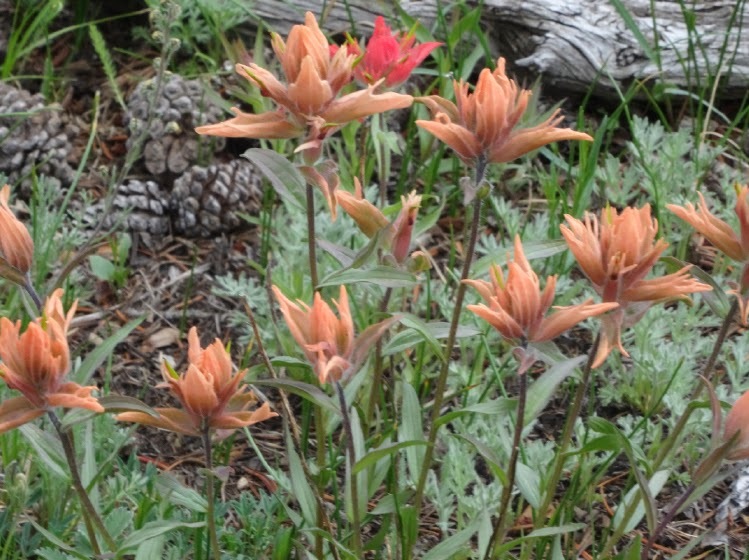 I want to do more wildflower hiking. 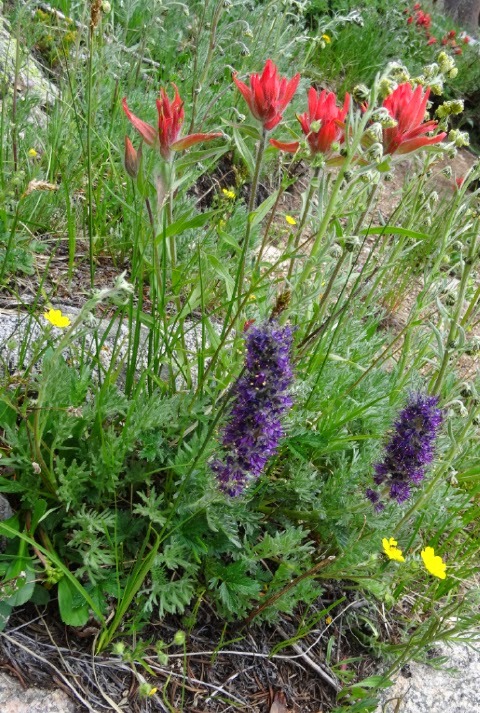 Our guide had traveled to Switzerland, Argentina, Chile, Turkey, Ireland, and New Zealand - just to look at wildflowers. 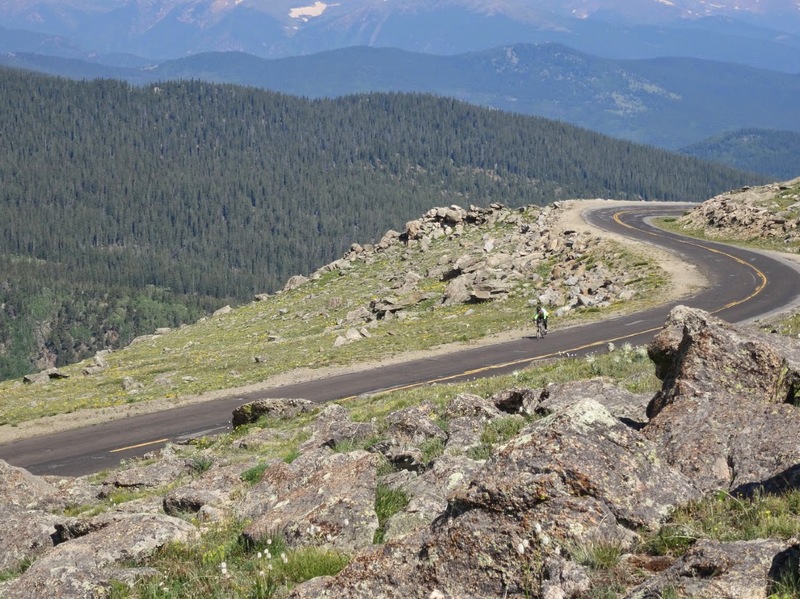 You can climb the Mount Evans Scenic Byway on your bike. Starting from Idaho Springs, you will climb 13-miles (21 km) on State Highway 193 to Echo Lake (and the Echo Lake Lodge), from here you will turn onto Colorado 5 (passing through a forest service pay station, free to bikes, $10 to cars) and continue a very long 15-miles (24 km) at altitude to the top. Much of your climb will be above tree limit, the area where average temperature is around 50F during the warmest month of the year. Conditions are wickedly changeable and the window of being able to ride this mountain in good weather is probably 6-8 weeks. Come prepared! 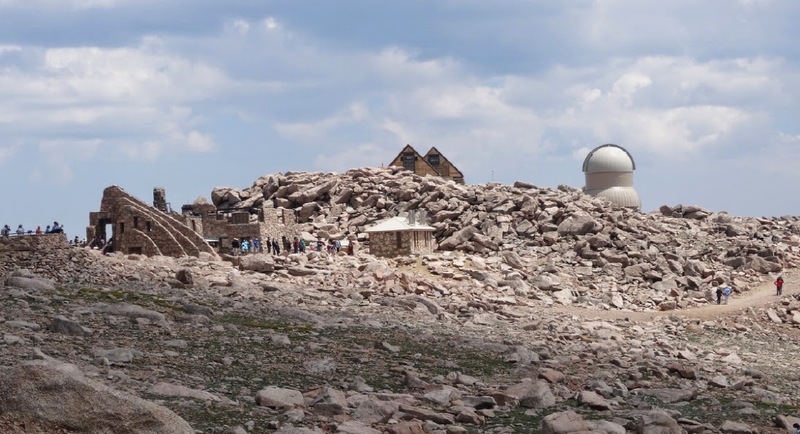 In July 2012 a tornado touched down northeast of the summit at an elevation of 11,900ft above sea level. The rough weather plays havoc on the road. Saying the road surface is rough is an understatement. 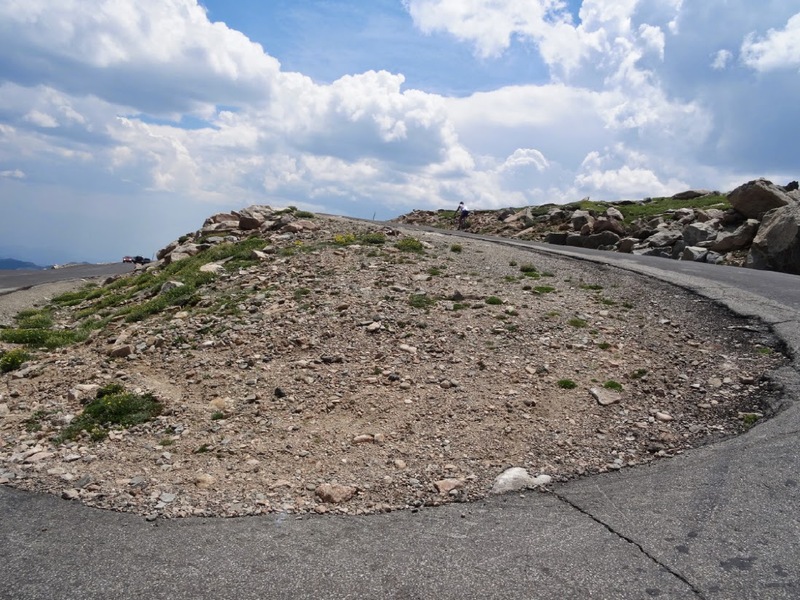 The descent will take a lot of concentration (by both cyclists and drivers) to avoid pot holes, cracks, drop-offs and cars. A spectacular view, but rough roads! Almost there! You will see bikers, runners, and hikers. Tweeting from the top - I made it! 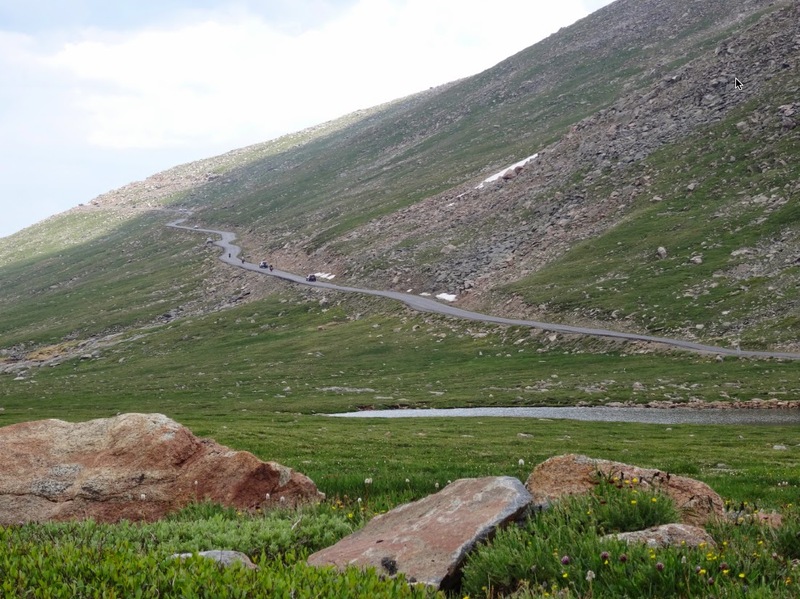 The road stops at 14,130 feet above sea level! Echo Lake Lodge is a good place to stop for a cold or hot drink. Hiking and fishing nearby. It was a beautiful day on the mountain!